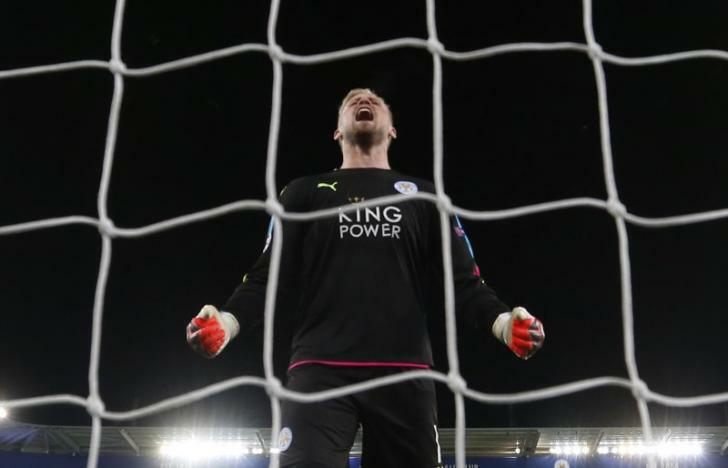 LONDON, March 15: Just like his father nearly two decades ago, Kasper Schmeichel proved a formidable last line of defence on Tuesday with a crucial penalty save against Sevilla to help Leicester City through to the Champions League quarter-finals. A performance reminiscent of his those given by his dad Peter, Manchester United's 1999 Champions league winner, reached a crescendo when the junior Schmeichel dived to his left to smother Steven N'Zonzi's 80th-minute penalty. It was the second time in the tie 30-year-old Schmeichel had saved a penalty, having also denied Joaquin Correa from the spot in the first leg when he almost single-handedly kept a dominant Sevilla side down to a slender 2-1 advantage. Goals by Wes Morgan and Marc Albrighton on Tuesday had rattled the Spaniards, who had Samir Nasri red-carded 14 minutes from time, but Leicester still needed their keeper who seven years ago was playing for Notts County in England's fourth-tier. Schmeichel senior, now 53, joined in the celebrations as Leicester's fans returned to dreamland in scenes reminiscent of last season's improbable Premier League title triumph. "It is a great feeling to help the team progress. It is about confidence," Schmeichel, who joined Leicester from Leeds United in 2011, said after the 3-2 aggregate win. "But that is what I'm there for. We have gone out and played more like we did last season and we are reaping the rewards of it now. It was a fantastic night." Leicester's performance was a throwback to the high-intensity football of last year and makes their season-long downturn in the Premier League even harder to fathom. Craig Shakespeare, named manager until the end of the season on Sunday having masterminded domestic wins against Liverpool and Hull City since the sacking of title-winning coach Claudio Ranieri, can now look forward to a Champions League quarter-final -- as well as the rigours of a relegation dogfight. Ranieri's former assistant said the key to the sudden turnaround was quite simple -- do as last season. "These players enjoy pressing from the front. We are a better team when we do that. The idea was to make it as uncomfortable as we could for Sevilla in the first 15 minutes," he said of the three-times Europa League winners. "We have just knocked out one of the best teams in Europe in my opinion. Their credentials are there for everyone to see and we can be immensely proud. "But it is only three games, somewhere along the line there might be a hiccup but I have to enjoy tonight." Skipper Wes Morgan, who scored the first goal, said Leicester were proving the doubters wrong again and would take "whoever comes" in the last eight draw. "We pulled off the impossible again," said Morgan who became the first Jamaican to score in the Champions League.